ბრიუს ლი (ინგლ. 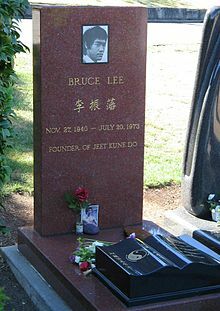 Bruce Lee; დაბადებაშ ჯოხო – ლი ჯუნ ფენი დ. 27 გერგობათუთა, 1940, სან-ფრანცისკო, ააშ — ღ. 20 კვირკვე, 1973, ჰონგკონგი) — ჩინარი კუნგ ფუშ ოსტატი, ფილოსოფოსი, არტისტი, კინორეჟისორი, პროდიუსერი, სცენარისტი, ჯიტ კუნ დო-შ დუმარსხუაფალი. გინოღალირი რე 36 კინოს. 1970-ამ წანეფს ბრიუს ლის უღუდჷ დიდი პოპულარობა ააშ-ს. არძოშ უმოს ჩინებული ფილმეფი რე: დიდი ბოსი, დრაკონიშ შარა, დრაკონიშ გიმულა დო შხვა. Bishop, James (2004). Bruce Lee: Dynamic Becoming. Dallas: Promethean Press. ISBN 0-9734054-0-6. Bolelli, Daniele (2008). On the Warrior's Path. Blue Snake Books. ISBN 1-58394-219-X. Campbell, Sid (2003). The Dragon and the Tiger: The Birth of Bruce Lee's Jeet Kune Do. 1 (illustrated ed.). Frog Books. ISBN 1-58394-089-8. Campbell, Sid (2006). Remembering the master (illustrated ed.). Blue Snake Books. ISBN 1-58394-148-7. Dennis, Felix (1974). Bruce Lee, King of Kung-Fu (illustrated ed.). Wildwood House. ISBN 0-7045-0121-X. თე ხასჷლაქ ეკონიას გეახალუ 21:34-ს, 8 პირელი 2019-ის.